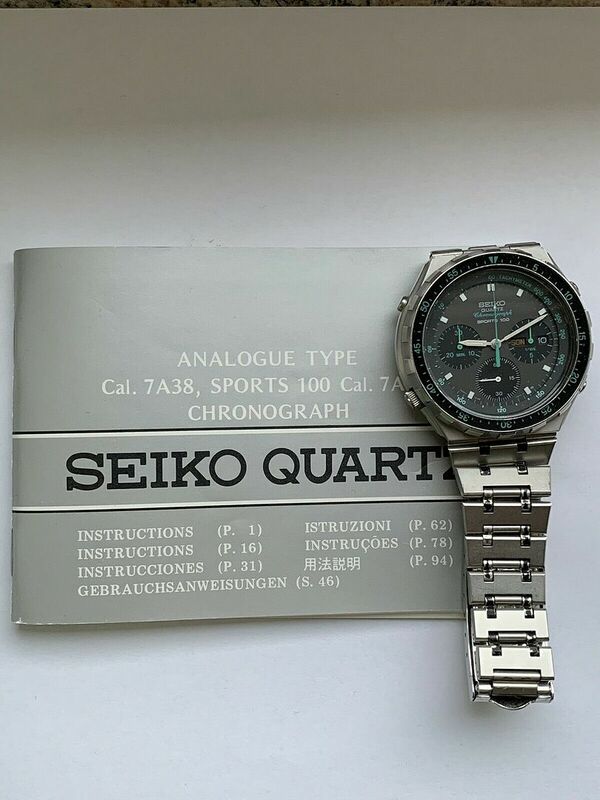 Those of you who were watching Yves' eBay listing for a 7A38-7050 (see my last post at the bottom of the previous page), had probably noticed it went unsold first time around. 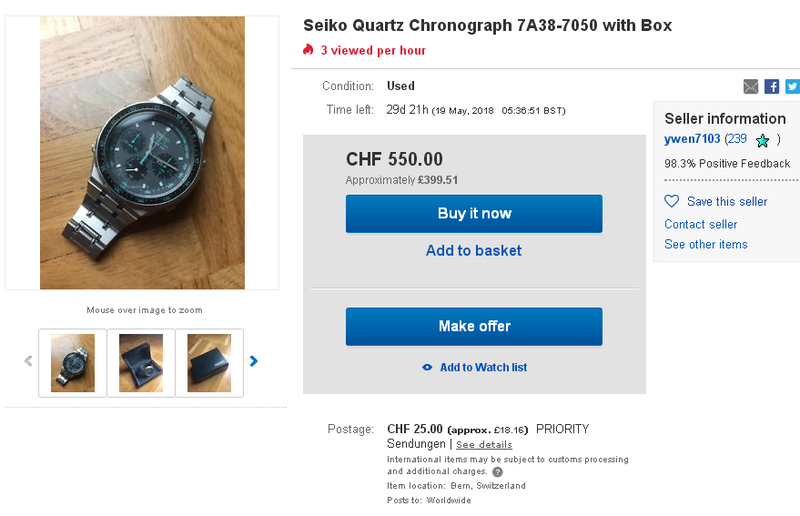 He re-listed it with the Buy-it-Now price reduced to 550 Swiss Francs, but then ended the re-listing as 'item no longer available' a couple of weeks ago. I'd assumed he'd sold it off eBay, via the 'back door' - as happens all too often nowadays. So out of curiosity, I emailed him, asking how much he'd sold it for. He replied, saying it hadn't actually sold. He was simply going on holiday and didn't want the listing to continue to run while he was away. 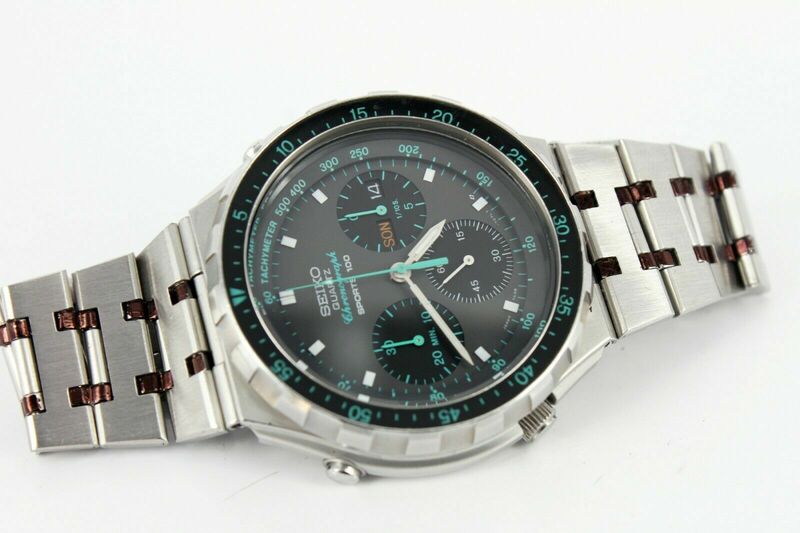 So you can imagine my surprise, when this listing for 7A38-7050 by a German eBay seller came up in a search result earlier this evening, looking very much like Yves' watch !! 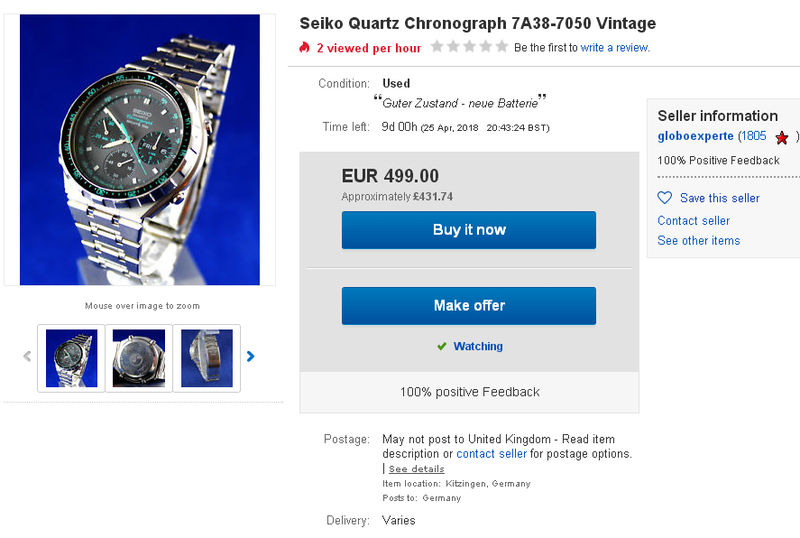 This evening, the German eBay seller's listing for a 7A38-7050 looks rather different to yesterday. As I'd half suspected, he'd 'cloned' Yves' ended listing as a basis to create his own. Though I don't see what he sought to gain, by publishing it in such a half arsed manner, then leaving it like that for a day. About half an hour ago, he uploaded 4 of his own photos and added a description. 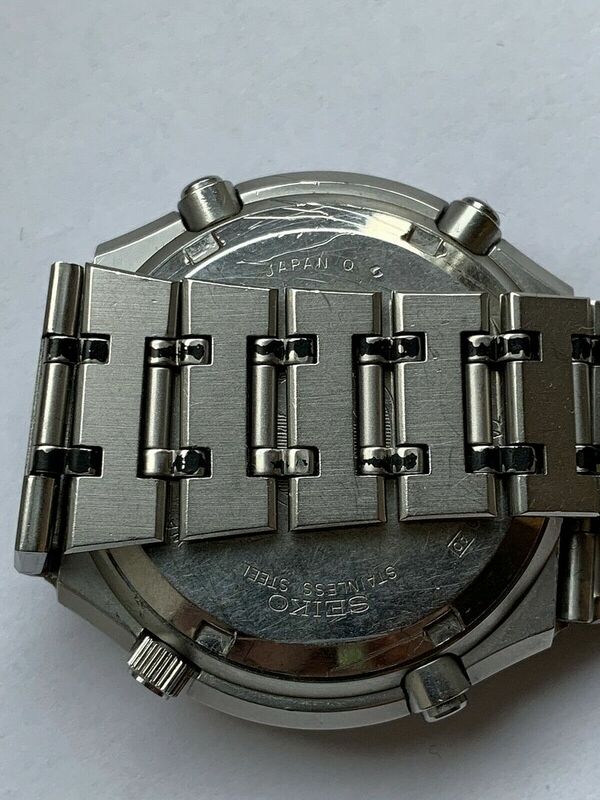 Typically, most if not all the matt black paint is missing from the p/n Z1148S bracelet's small interconnecting links. 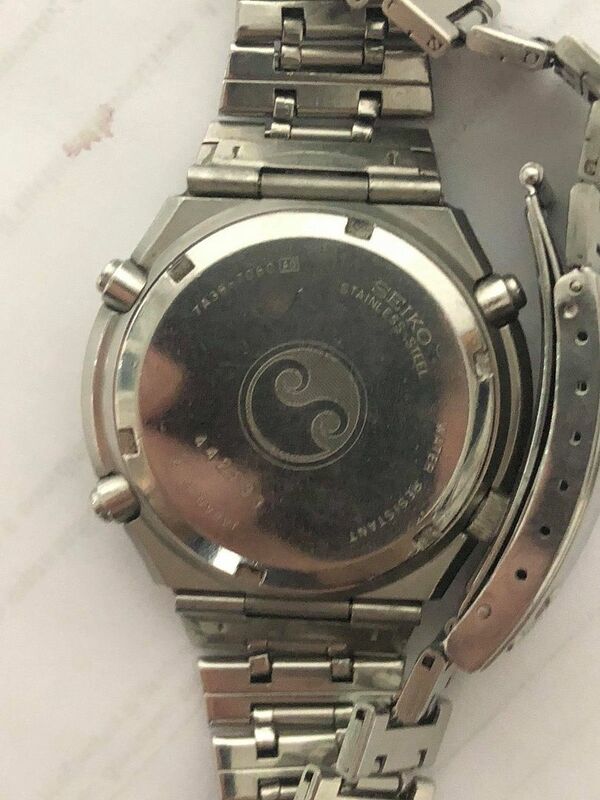 Looks like he's had the movement out of the case at some point, because the Tachymeter ring's orientation is out by almost 180 degrees. ist vollständig und reicht locker bis 20cm HGU. das Glas ist Top. Die Zeiger haben leichte Patina. gepflegt mit sehr wenigen Nutzungsspuren. Looks like Yves is back from his holiday. This morning he re-listed his 7A38-7050. Photos and description are same as before (see bottom of previous page). Status Quo restored. 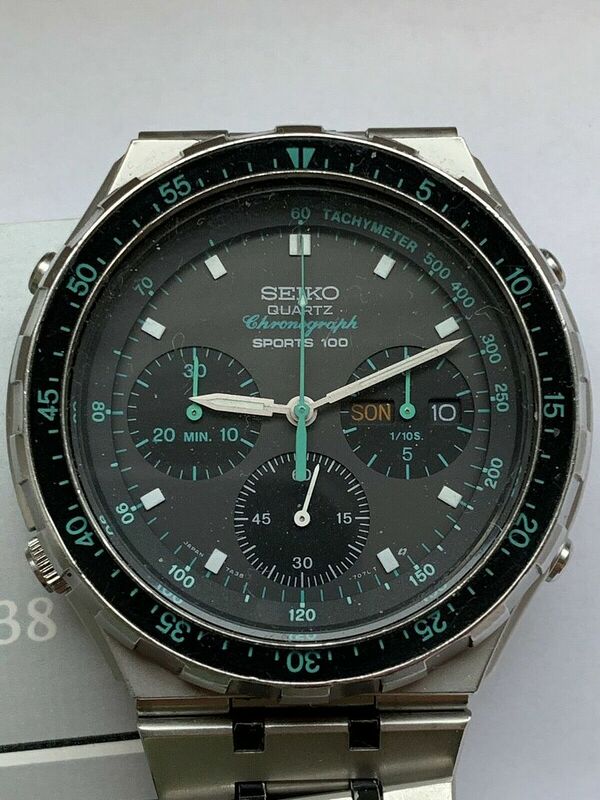 Over the course of the the last week, German eBay seller globoexperte had made a number of revisions to his listing for a 7A38-7050. These included two changes to the Buy-it-Now price: latterly a reduction to the slightly odd figure of 443.85 Euros. (It doesn't equate to any particular percentage). It sold yesterday evening, but not for the reduced Buy-it-Now price, nor anything like it, in fact. Despite all his screwing around with the listing, it's clearly evident that this self-appointed 'Global Expert' had no real idea of its potential worth. 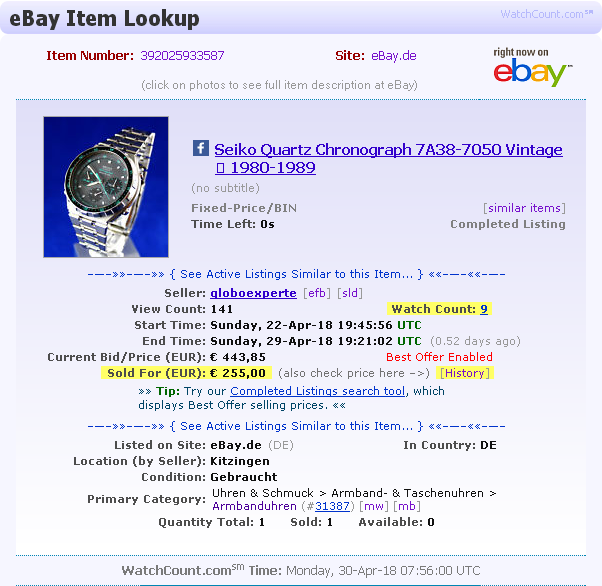 WatchCount.com's Look-up tool reveals he let it go for an offer of only 255 Euros. 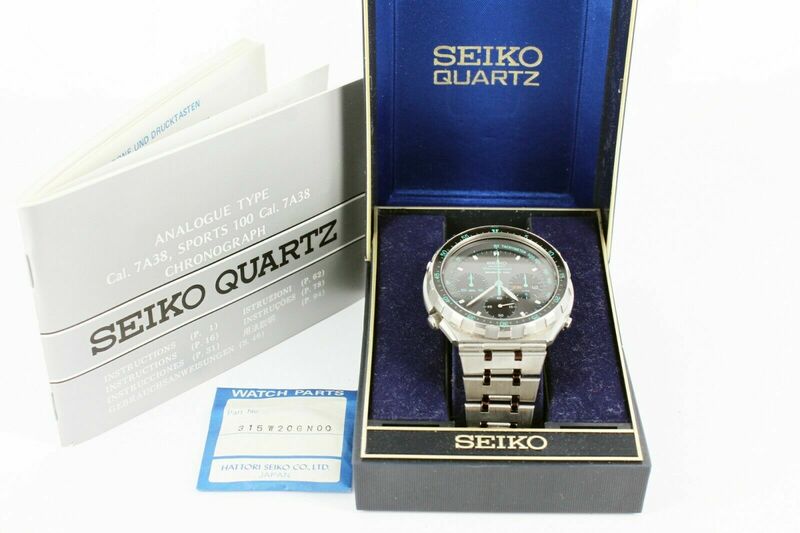 This listing for a 7A38-7050 in decent cosmetic condition, by Italian eBay seller welovevintagewatches, appeared yesterday evening - effectively as a 3-day auction with an opening bid price of 19.90 Euros. 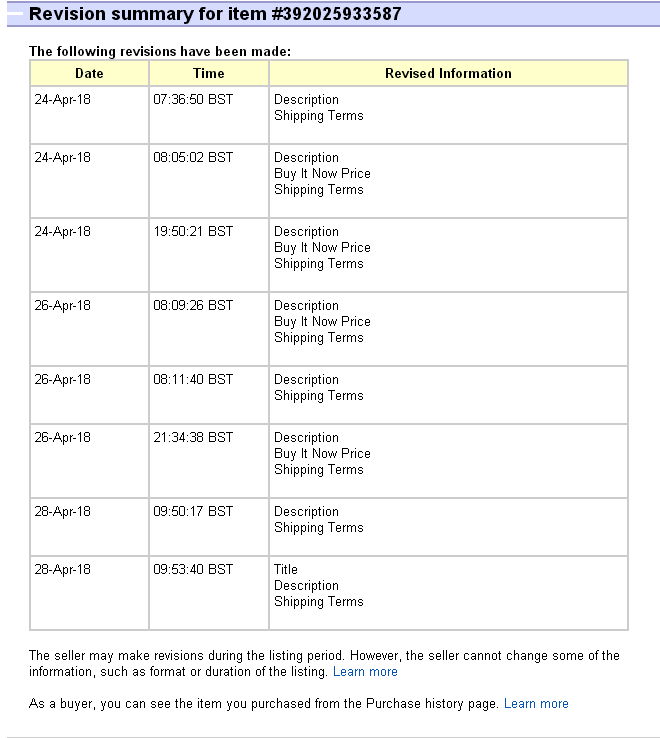 However, if you check the bidding history, it shows it was supposed to be a 5-day listing starting on Wednesday 10th. The first bid wasn't placed until 7:20pm yesterday, so presumably nobody else saw it any earlier either. Bidding is currently @ 71 Euros. 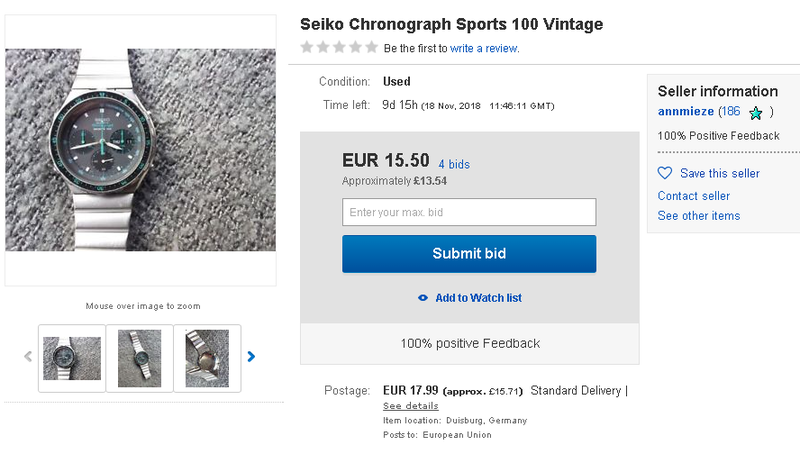 As per their normal practice, this seller has only uploaded a single composite image. 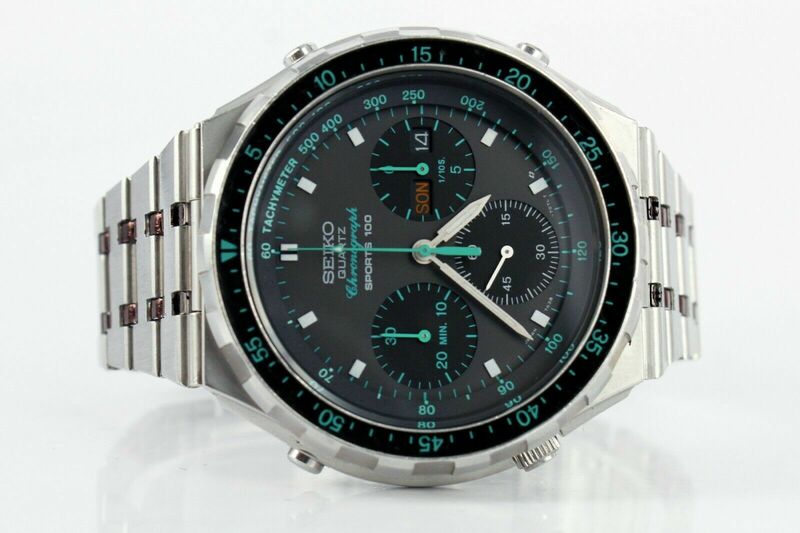 SEIKO Quartz CHRONOGRAPH 7A38-7050 - Raro Orologio Vintage degli anni '80. L'orologio è funzionante e tiene bene il tempo. Il chrono funziona bene. Diametro della cassa esclusa corona: circa 40mm. Ghiera Girevole. 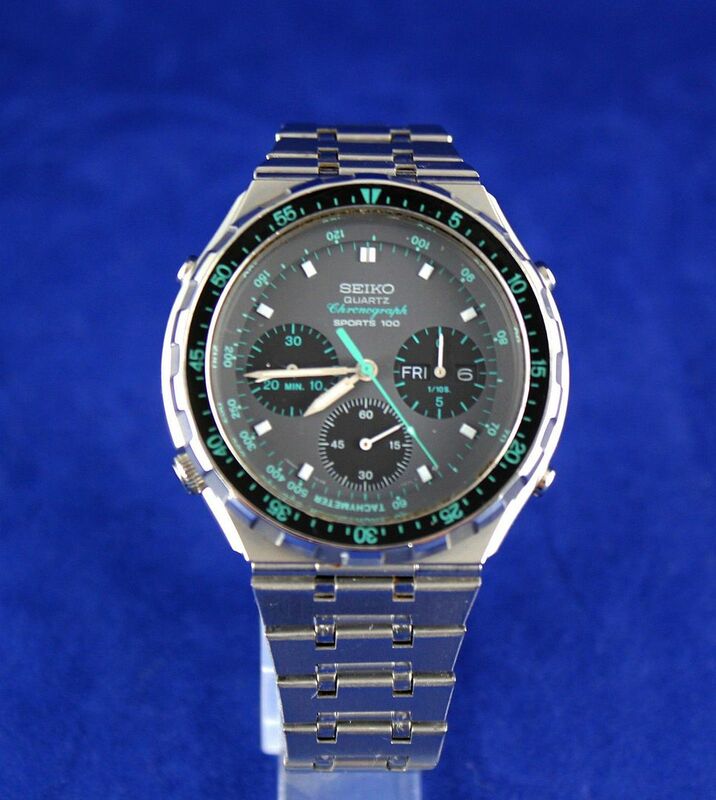 Cinturino Originale SEIKO in Acciaio in buone condizioni: è adatto per un polso di massimo 19/19,5cm. Le condizioni di cassa, vetro, quadrante, sfere, pulsanti e corona sono molto buone. Ci sono pochi piccoli graffi e segni su cassa e fondello. SUGLI OROLOGI DOVUTI AL NORMALE UTILIZZO CHE NON SONO VISIBILI NELLE FOTO. "WeLoveVintageWatches" vi augura una buona asta !!! 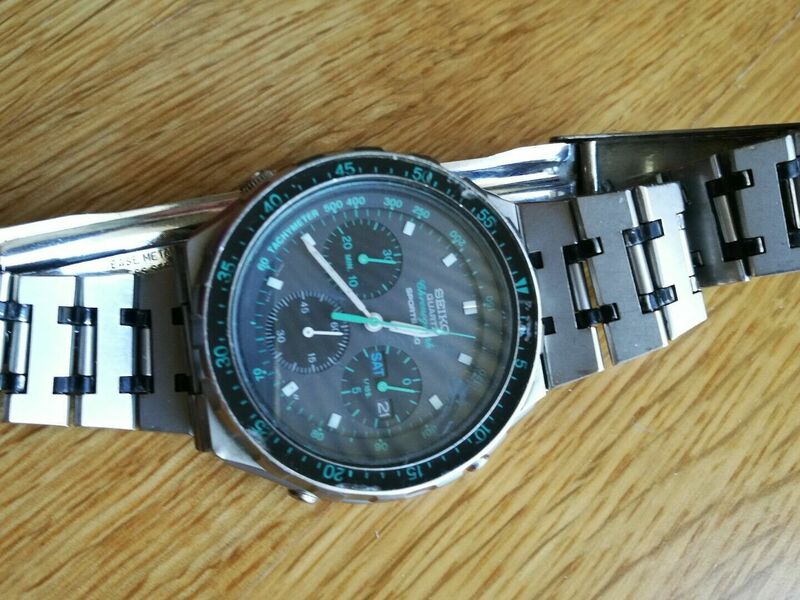 SEIKO Quartz CHRONOGRAPH 7A38-7050 - Rare Vintage Watch from the 1980s. Working Condition and keeping good time. The chrono function works fine. Case Diameter excluding crown: approximately 40mm. Rotating Bezel. 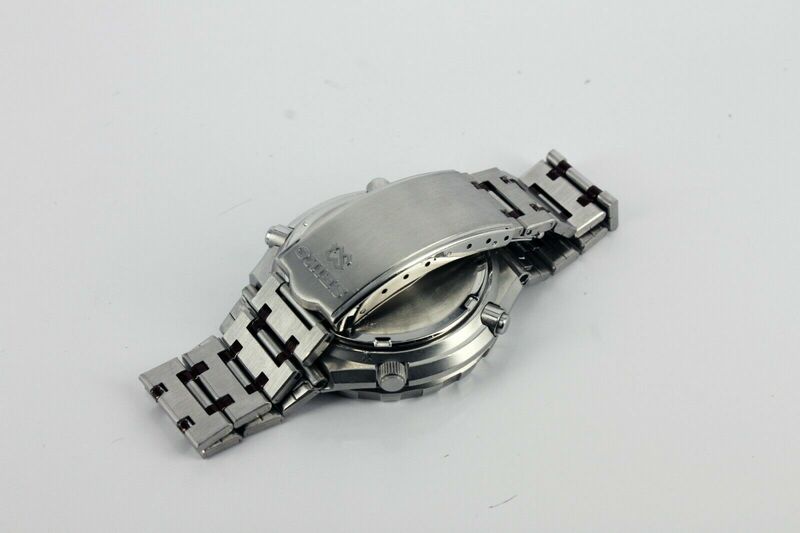 Original SEIKO Stainless Steel Bracelet in good conditions: it's suitable for a wrist of maximum 19/19,5cm. The conditions of the case, glass, dial, hands, buttons and crown are very good. There are few little scratches and marks on the case and case back. 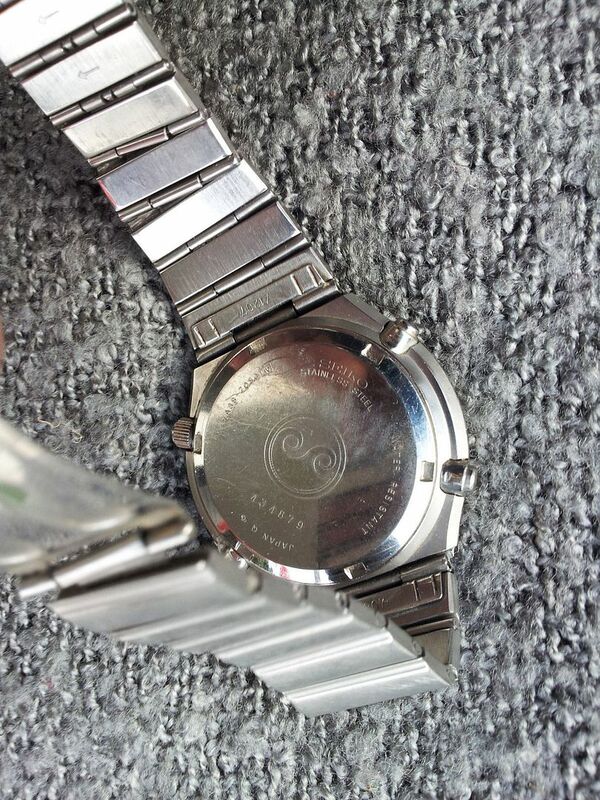 ON THE WATCHES FROM GENERAL WEAR WHICH ARE NOT SEEN IN THE PHOTOS. 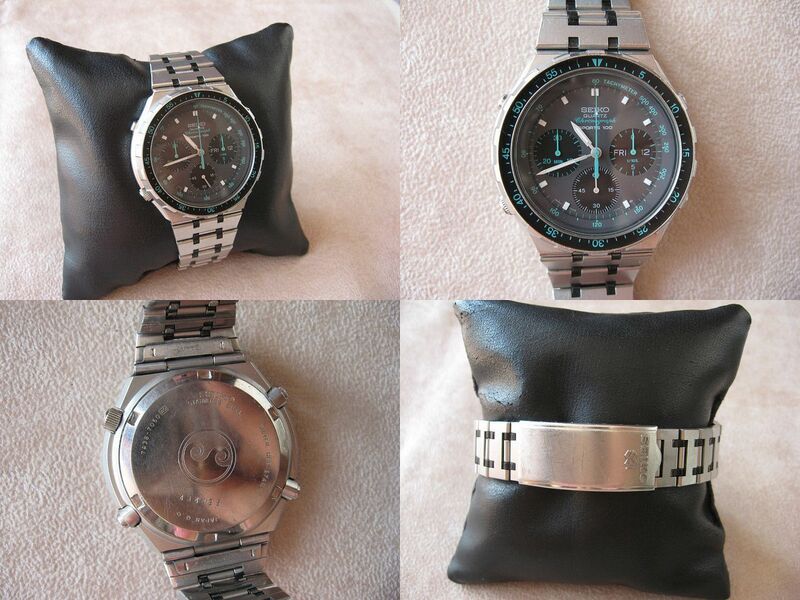 "WeLoveVintageWatches" wishes you a good auction !!! That 3-day (or was it 5-day?) 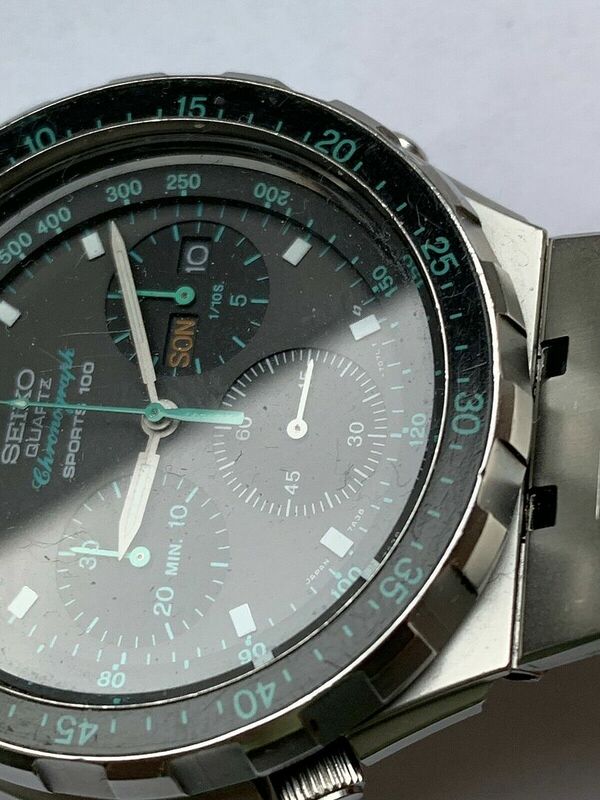 Italian eBay auction for what appeared to possibly be a very nice example of the 7A38-7050 SAA025J ended yesterday evening, in what can only be described as a bidding war. I'd placed a couple of 'throwaway' bids on it, with no intention of following through. I didn't need another. I had planned to watch the auction ending live, but was distracted. Wish I had, now. 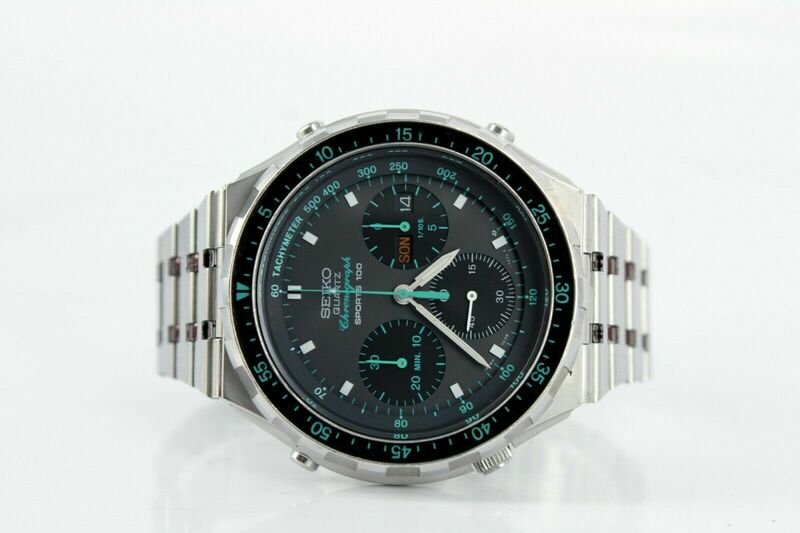 The last time I'd looked at it, around teatime yesterday, the bidding was still under 250 Euros (after approx. 30 bids). Another 35 bids were placed in the last half hour of the auction. 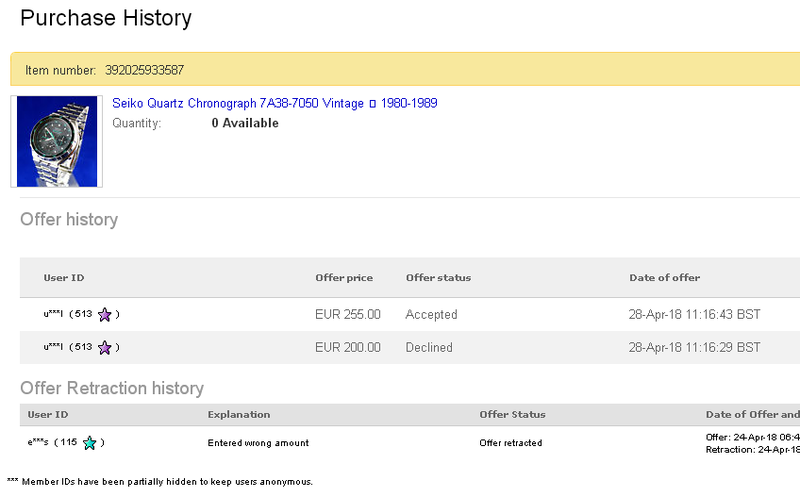 It finally ended up selling for an impressive 621 Euros after 65 bids. 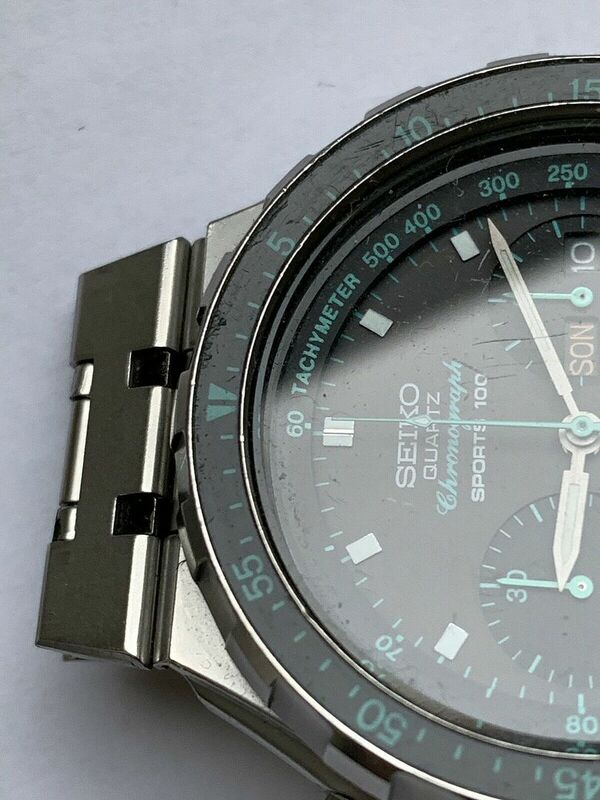 This 7A38-7050, in average worn condition, fitted with an incorrect replacement Seiko bracelet, was listed this time yesterday morning by a German eBay seller as a 10-day auction, with an opening bid price of 1 Euro. 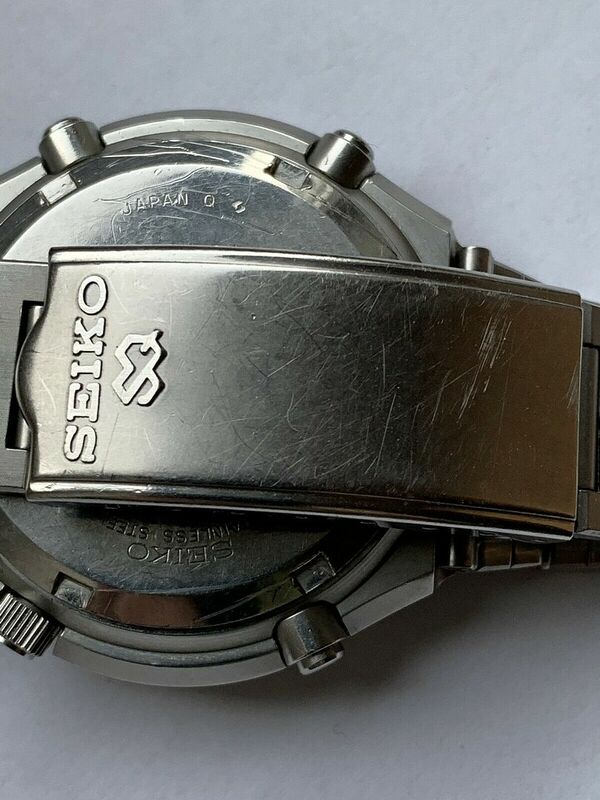 The rather tired looking bracelet is a Seiko p/n Z1207S, normally found on the stainless 7A38-6020. 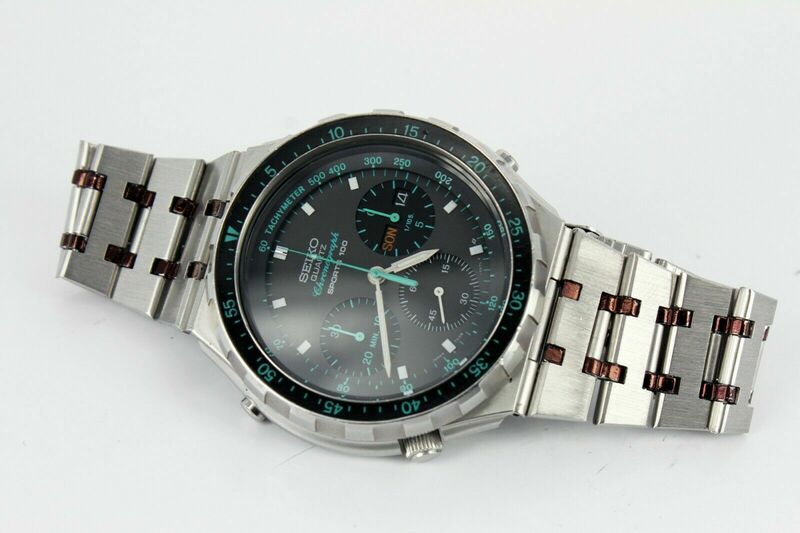 (This bracelet shares the same pin and tube fixing method as the correct p/n Z1148S). 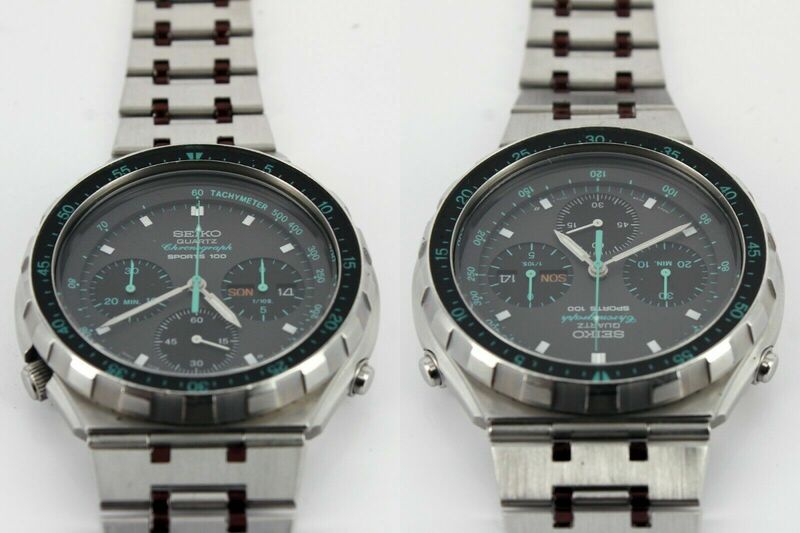 At first, it reminded me of the 7A38-6020 and 7A38-7050 listed by UK eBay seller lesterplant (where he'd swapped bracelets), back in early 2013 (documented on the first page of this thread). But, best I can tell, this isn't the same watch. 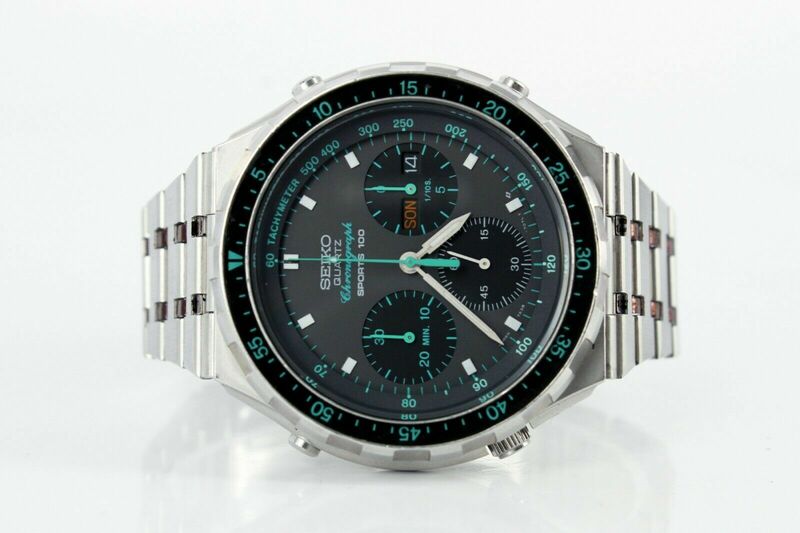 Biete aus Erbschaft einen Seiko Chronograph Sports 100 incl. Bedienungsanleitung in englisch - französisch - spanisch - deutsch - italienisch - portugiesisch und japanisch. Die Uhr läuft einwandfrei und ist sehr ganggenau, das Uhrglas ist offensichtlich kratzerfrei, an dem Armband sind Gebrauchsspuren vorhanden. Über Wasserdichtigkeit kann ich keine Angaben machen. Die Gebrauchsanleitung zeigt alle Fähigkeiten der Uhr auf. 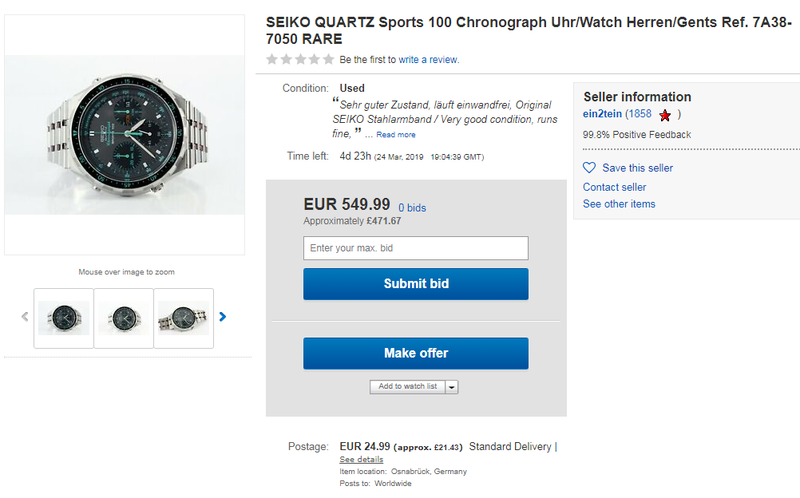 The above 10-day German eBay auction for a 7A38-7050, fitted with the wrong bracelet (p/n Z1207S off a stainless 7A38-6020), ended a few moments ago, selling for 303 Euros after 35 bids. 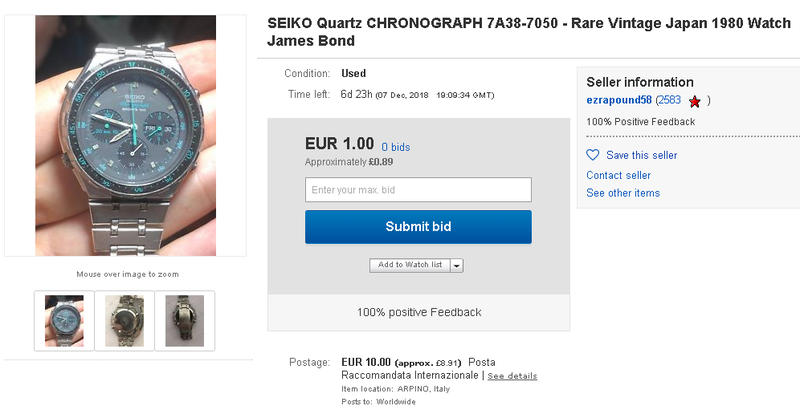 This well-worn 7A38-7050 was listed earlier this evening, by a 'James Bond' keyword spamming Italian eBay seller, as a 7-day auction, with an opening bid price of 1 Euro. 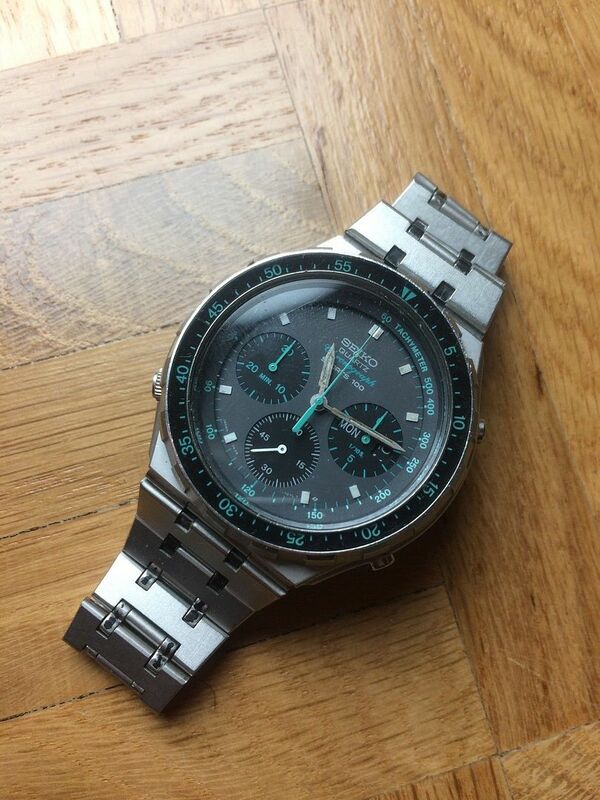 I'm sure '007' wouldn't be too keen to use this particular watch for his 'nocturnal activities', given the badly degraded lume. L'orologio è funzionante e tiene bene il tempo. Il chrono non funziona bene. VENDUTO COSÌ COM'È - PER FAVORE GUARDA BENE LE FOTO. Working Condition and keeping good time. 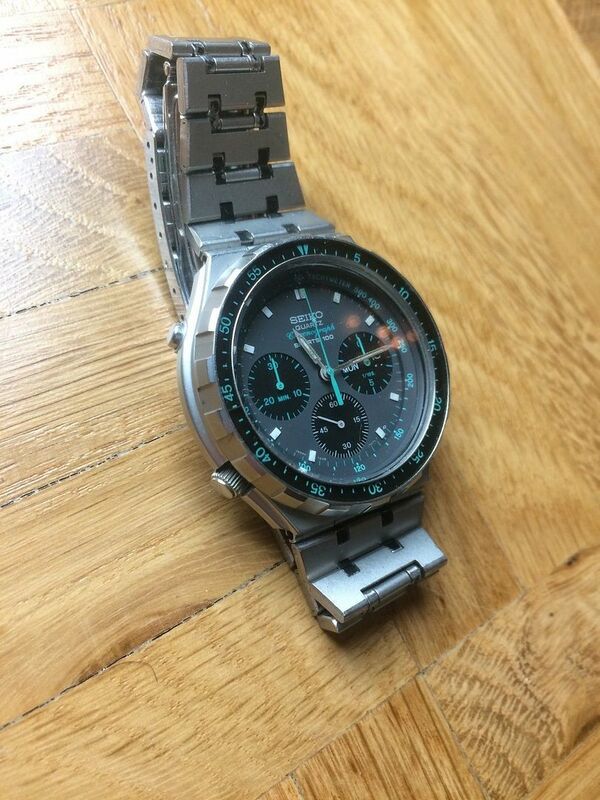 The chronograph not function good. 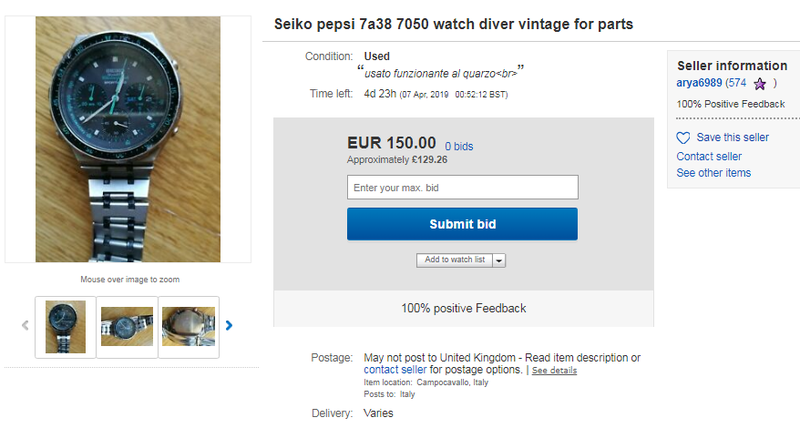 I haven't bothered comparing them word for word (nor sentence for sentence), but going by the fact it's green (and in multiple fonts) and also badly written in both English and Italian, I'd hazard a guess that this seller likely copied the bulk of his description from welovevintagewatches listing in October (higher up the page). 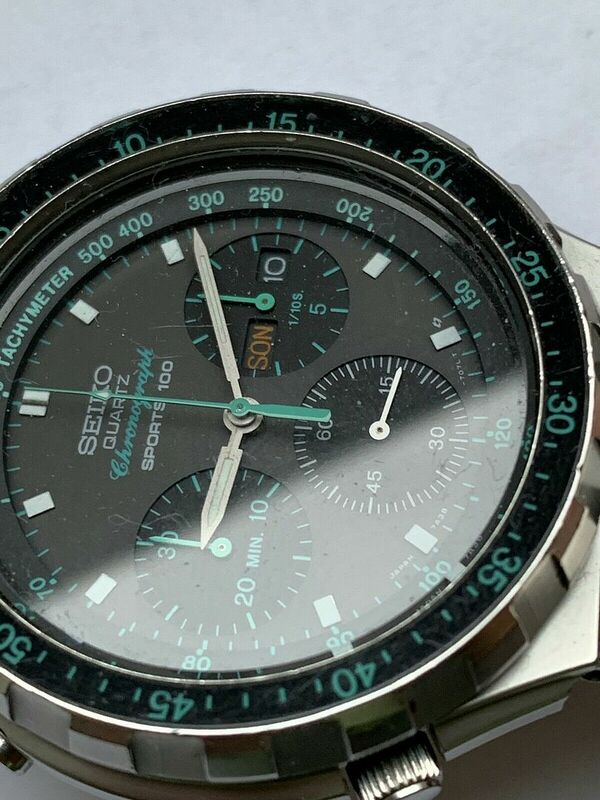 The above 7-day Italian eBay auction for a well-worn 7A38-7050 ended a few moments ago, selling for 212.88 Euros after 29 bids. 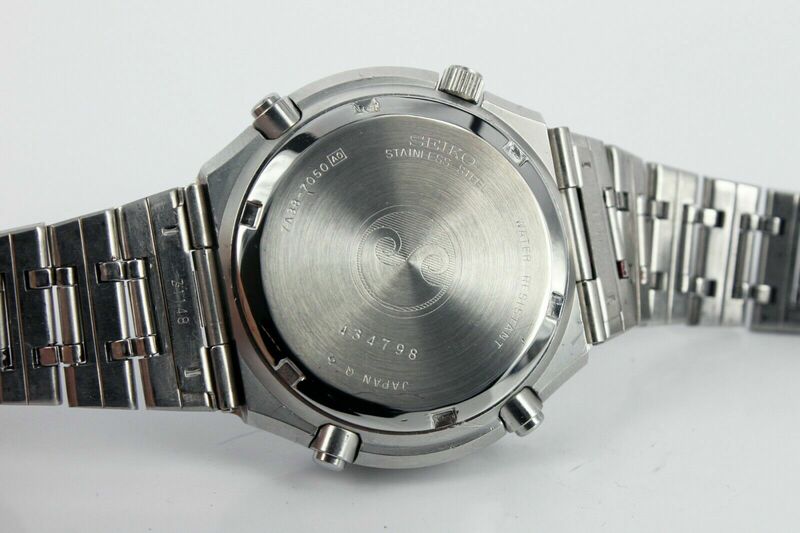 This 7A38-7050 in average worn condition was listed earlier this evening by a German eBay seller as a 7-day auction with an opening bid price of 1 Euro (there was an option to make an offer, which has expired now that bidding is under way). Academic anyway, because the narrow-minded seller won't ship Ausland. 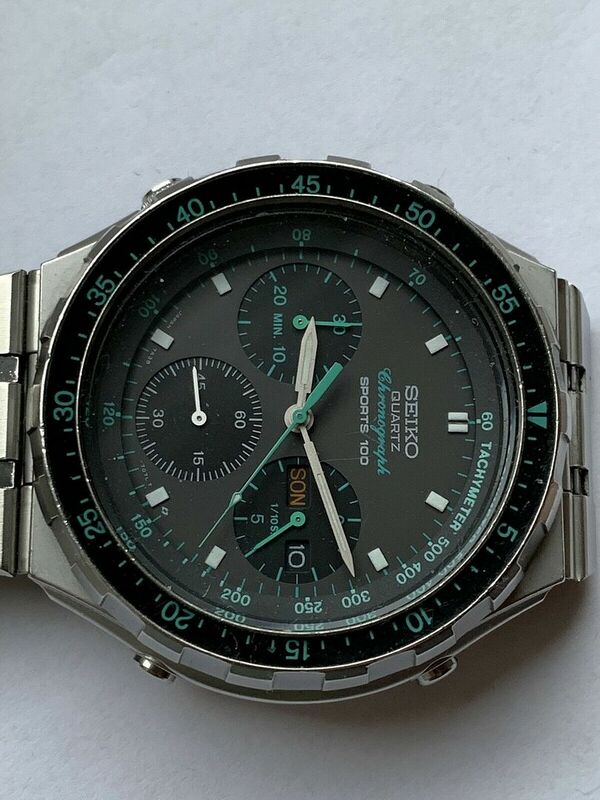 Zum Verkauf steht eine getragene Seiko Quartz Chronograph Sports 100 7A38-7050 Herrenuhr. Die Uhr läuft und sie weist altersbedingte, deutlich sichtbare Gebrauchsspuren auf. Bezahlen kann man nur per Überweisung auf mein Bankkonto oder in bar bei Abholung. Der Artikel muss innerhalb von drei Tagen bezahlt werden. Auf Wunsch kann ich weitere Fotos nachreichen. Kein Versand ins Ausland. No international shipping! Fragen bitte ich rechtzeitig und vor Gebotsabgabe zu stellen. Des Weiteren gibt es keine Garantie, keine Rücknahme, kein Nachverhandeln. 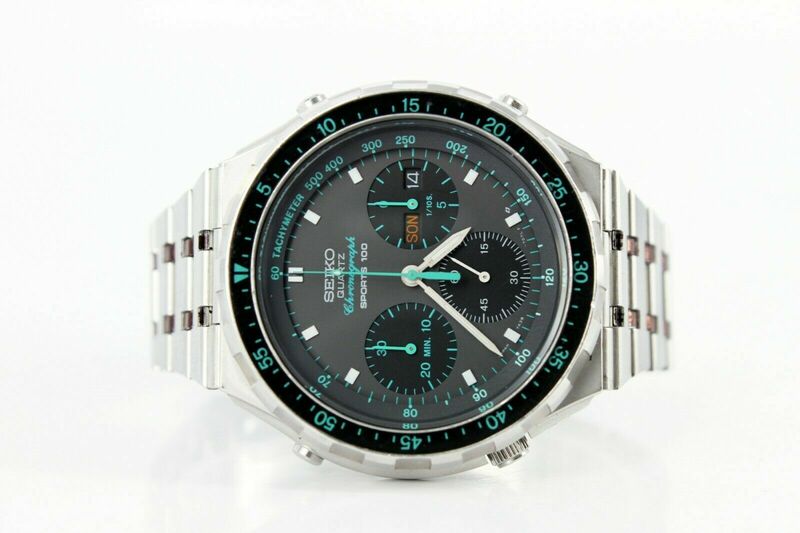 The above 7-day German eBay auction for a 7A38-7050 ended a few moments ago, selling for a strong 338.99 Euros after 39 bids. This 7A38-7050, in what at first might appear to be very nice condition, was listed earlier this evening, by a German eBay seller, as a 5-day auction, with a somewhat over-optimistic opening bid price of 549.99 Euros. 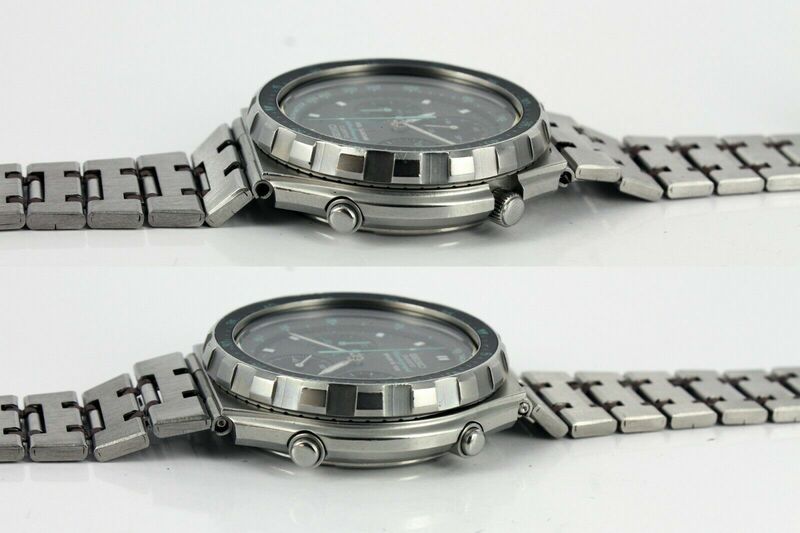 One of the most common niggles with this model (and it's 7A38-705A sibling) is the loss of matt black paint from the bracelet's small interconnecting links. These links look a bit of an odd colour in the seller's first half a dozen photos. 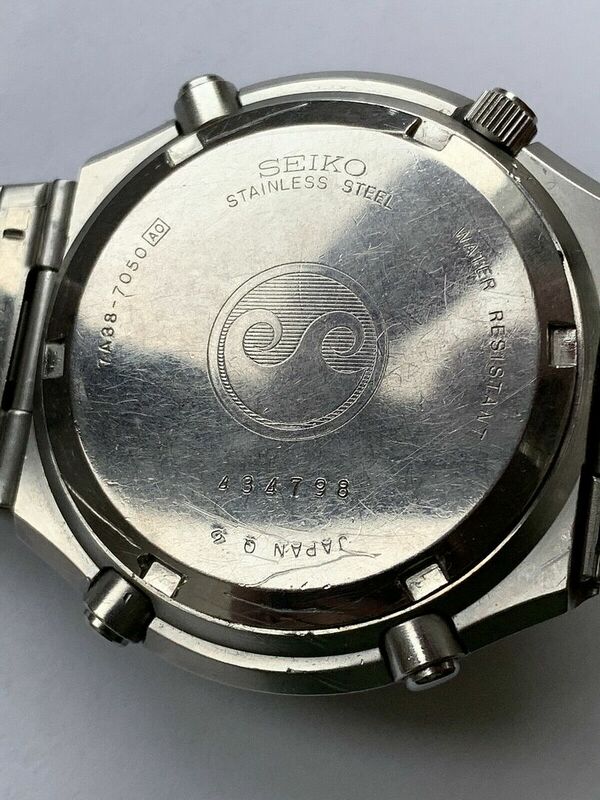 If you skip to the penultimate image (showing the underside of the bracelet) these small links are shiny, with no residual trace of the paint. I reckon he's tried to re-touch the links with a permanent marker. Note the seller's own comment in the English language part of the description, which I've highlighted in red. In fact, this is yet another case of Déjà Vu (or should I more correctly say 'Bereits gesehen') - and a very recent one at that. 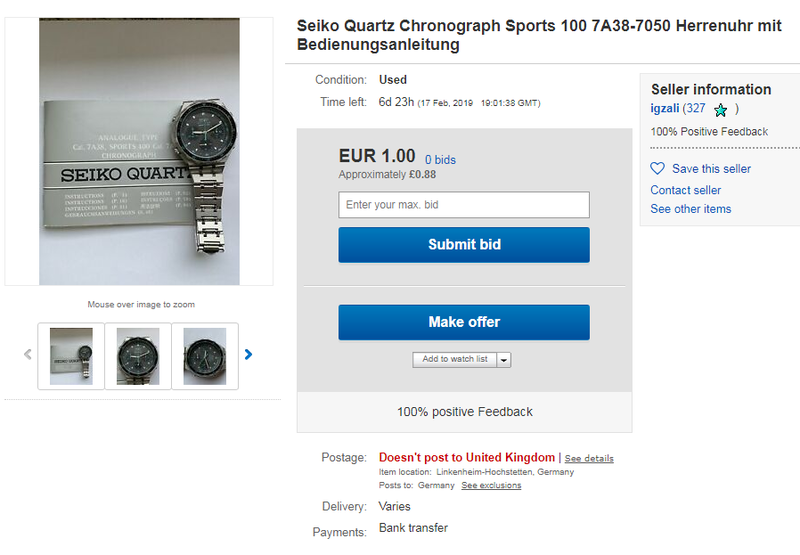 Zum Verkauf steht hier eine sehr seltene SEIKO QUARTZ Sports 100 Chronograph Herrenversion Uhr in hervorragendem Sammler- und Tragezustand. 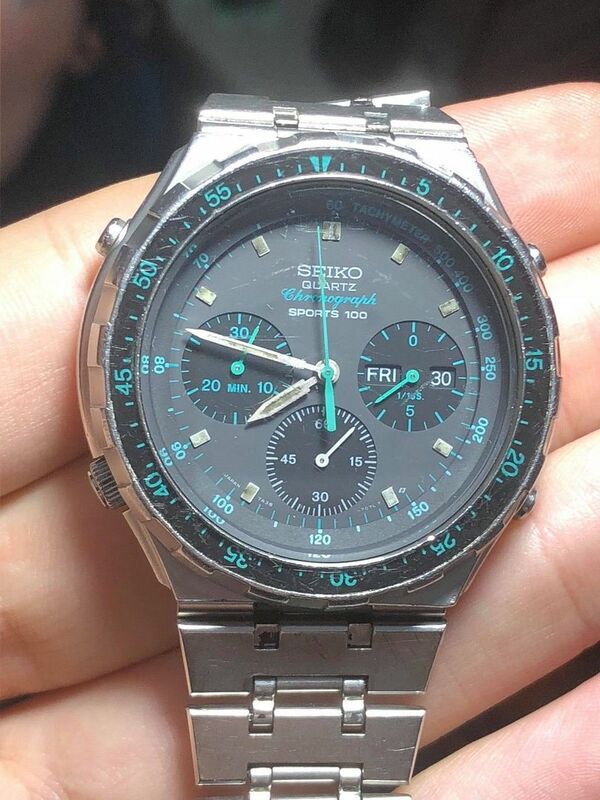 Das SEIKO Cal. 7A38A Uhrwerk läuft sofort an und hält die Zeit sehr gut. Ich konnte keine gravierende Gangabweichung feststellen. Alle Funktionen sind einwandfrei. Die Uhr kommt mit Originaler Box und Bedienungsanleitung. Der Zustand des Stahl Gehäuses ist sehr gut, siehe Bilder. Das wunderschöne schwarze Zifferblatt befindet sich in originalem Zustand und zeigt nahezu keine Gebrauchs- oder Alterungsspuren. 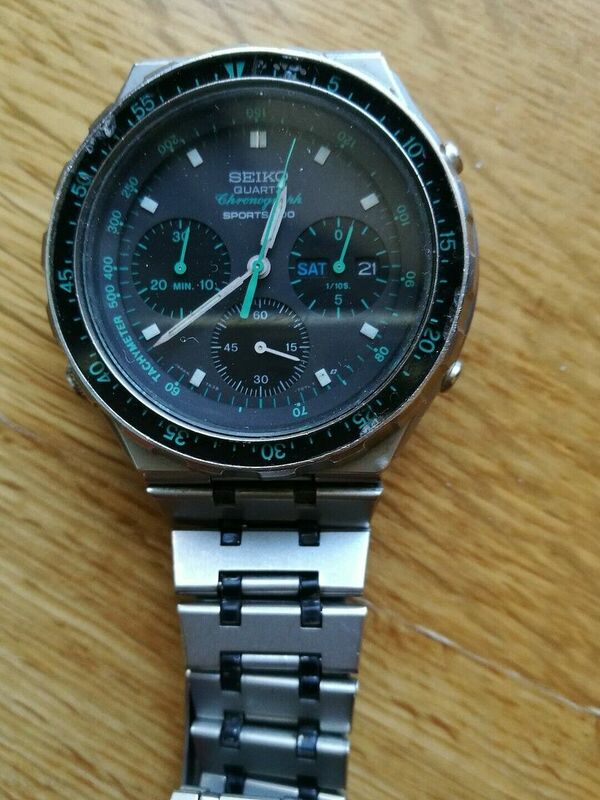 Die Zeiger und das neue Original SEIKO Uhrglas sind in einem neuwertigen Zustand. 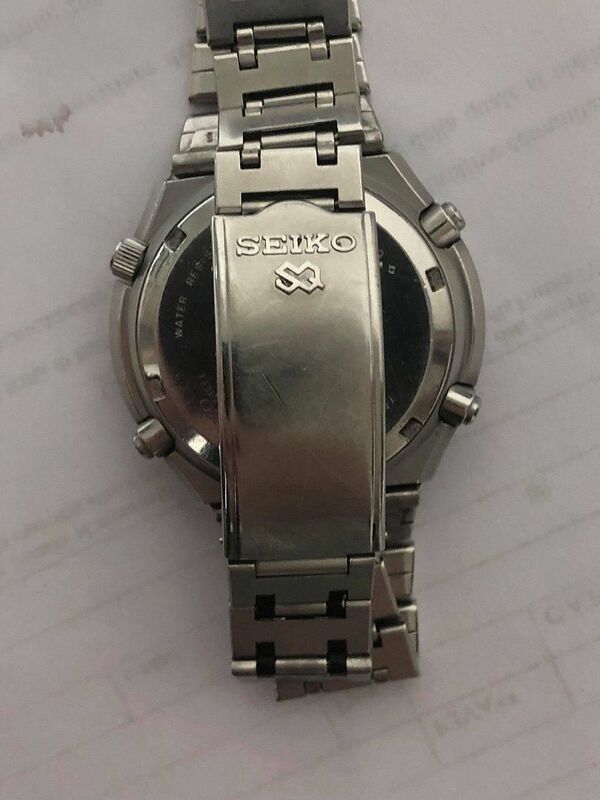 Montiert ist das seltene Original SEIKO Stahlarmband samt Original SEIKO Faltschließe. Bitte beurteilen Sie den optischen Gesamtzustand selber anhand der umfangreichen Bilder! 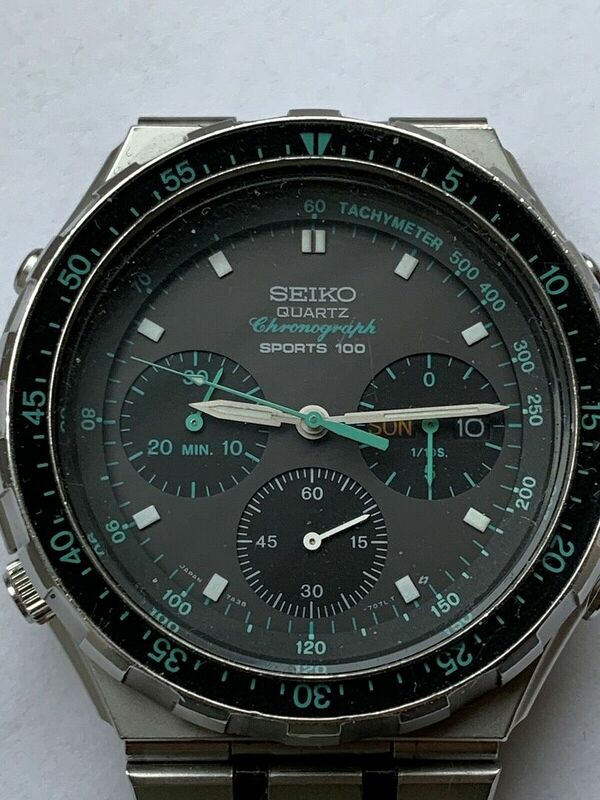 Up for sale is here a very rare SEIKO QUARTZ Sports 100 Chronograph men's version watch in great collector and carrying state. 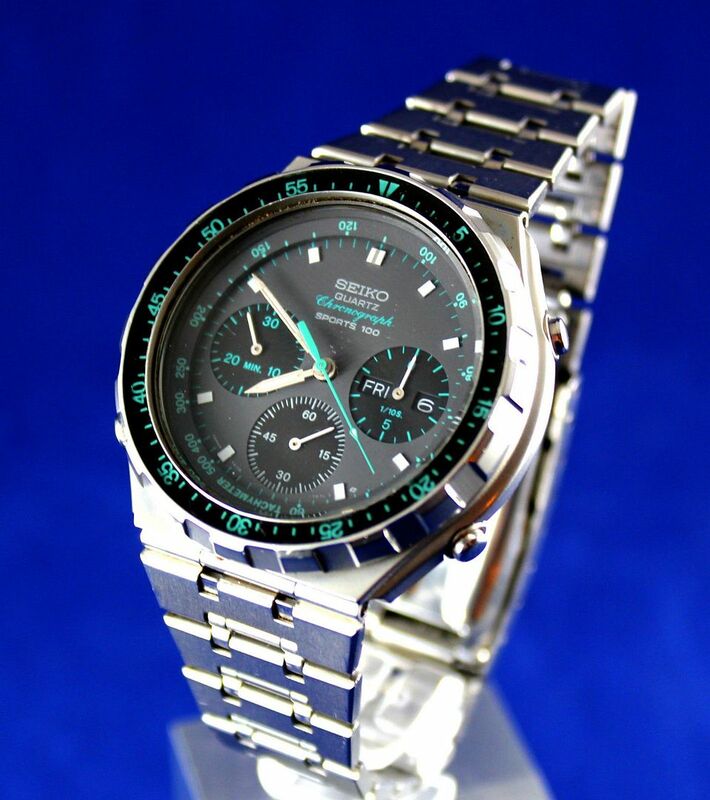 The SEIKO Cal. 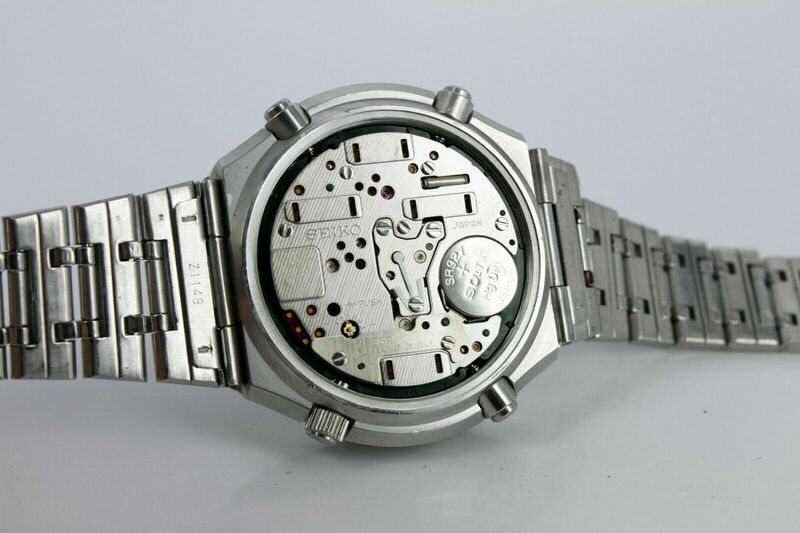 7A38A movement runs immediately and keeps time very well. All functions are working fine. 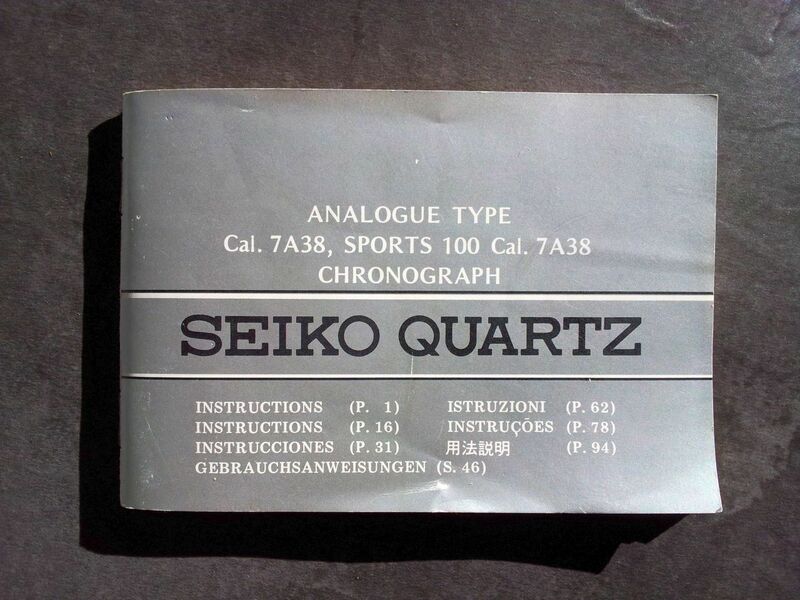 The watch comes with Original Box and manual. The state of the steel housing/case is very good, see pictures. The beautiful black dial is in original condition as well and shows almost no signs of wear or aging. 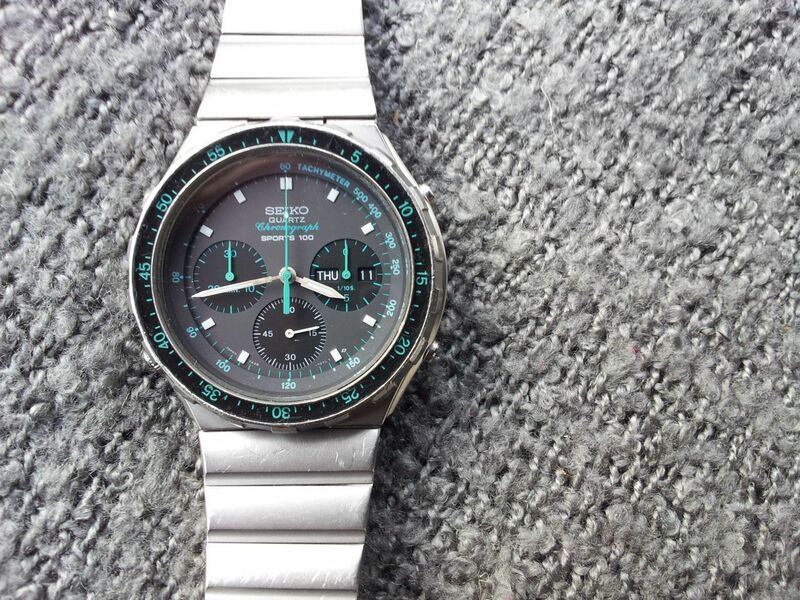 The hands and the new Original SEIKO crystal are in as new condition. 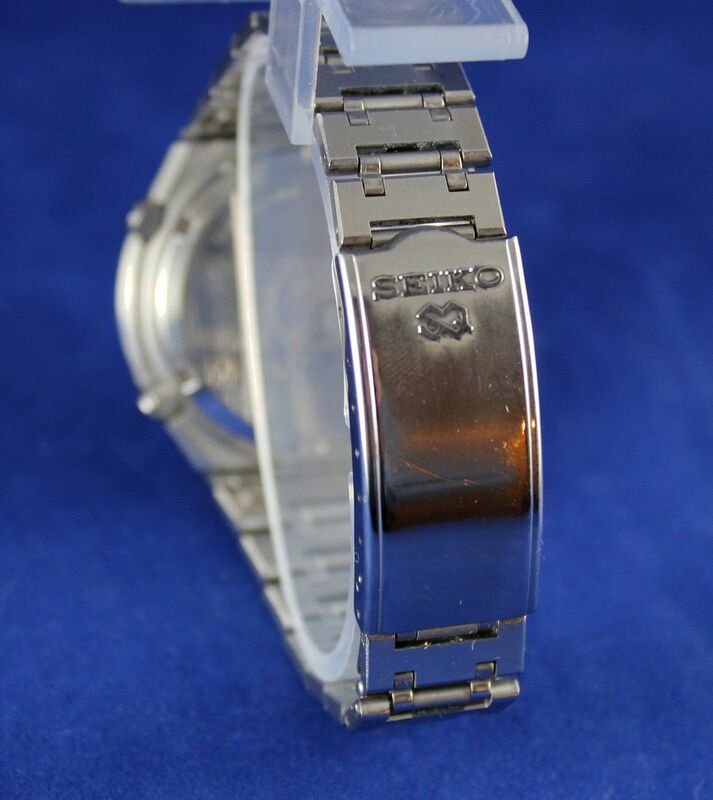 Mounted is the rare Original SEIKO Steel Bracelet together with the Original SEIKO folding clasp. 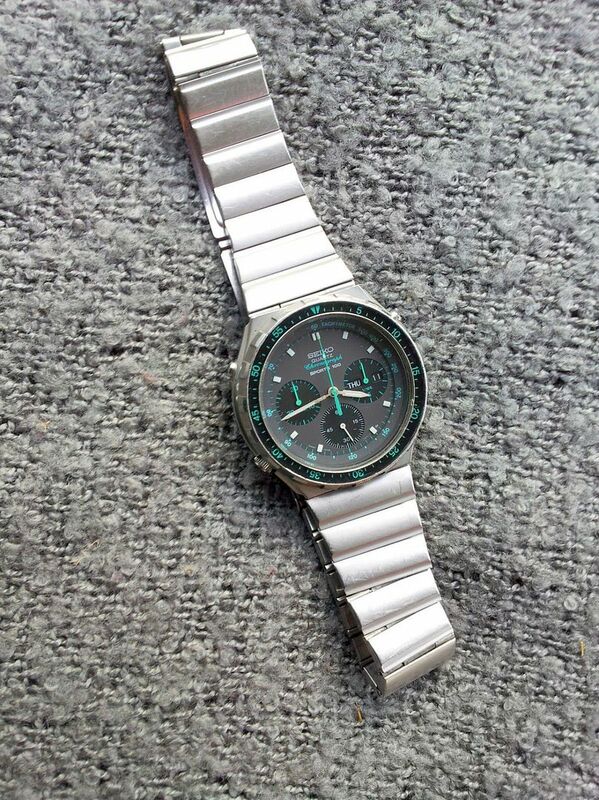 Please evaluate the overall visual state of the watch by yourself on the basis of the images! Uhren sind der Valorenklasse II zuzuordnen, es gelten die Beförderungsbedingungen der DHL. Eine Haftung beim Versand meinerseits erfolgt ausschließlich nach den Richtlinien der Beförderungsbedingungen der Valorenklasse II. 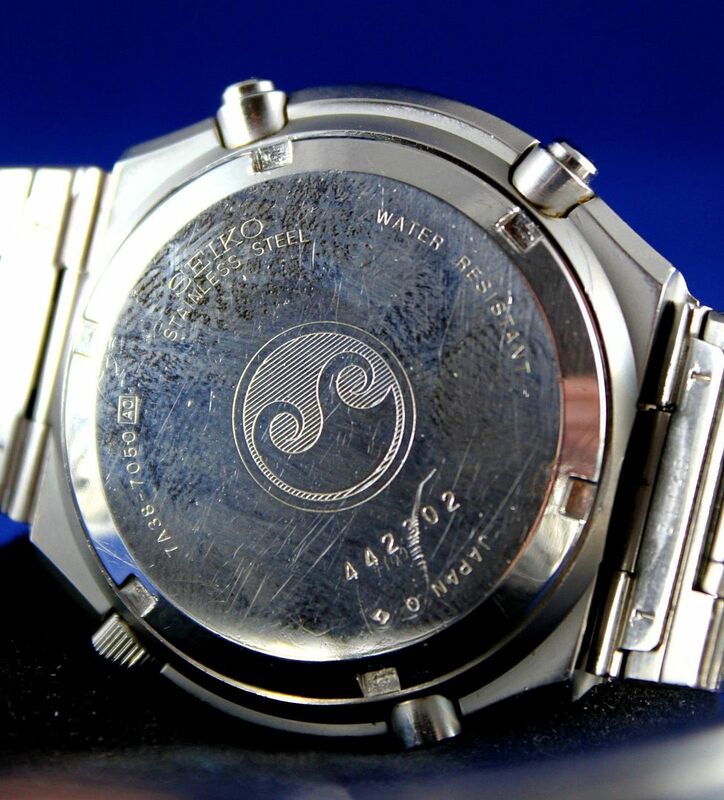 Watches are assigned to the Valorenclass II. The conditions of carriage of the DHL apply. A liability for shipping takes exclusively according to the guidelines of the conditions of carriage of the Valorenclass II from the DHL place. 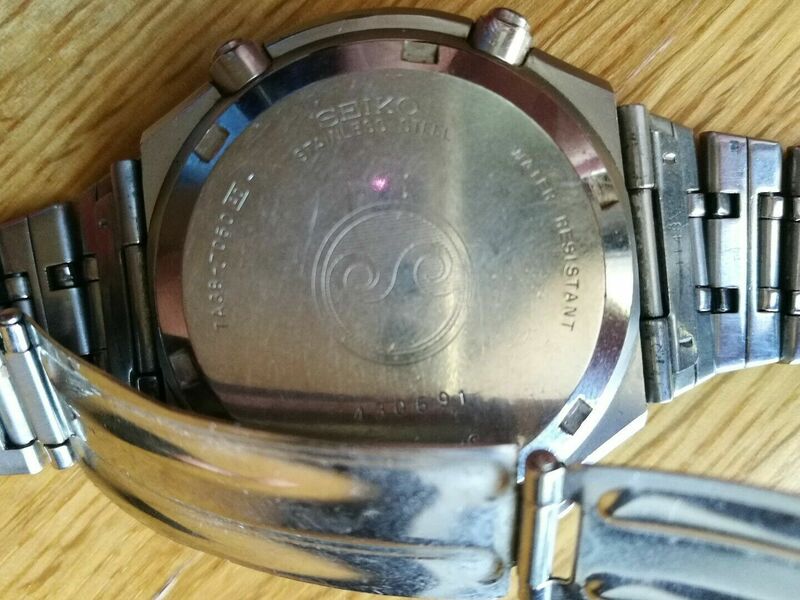 This is of course, the very same 7A38-7050, case-back s/n 434798, which sold on eBay Germany just over a month ago for 338.99 Euros. 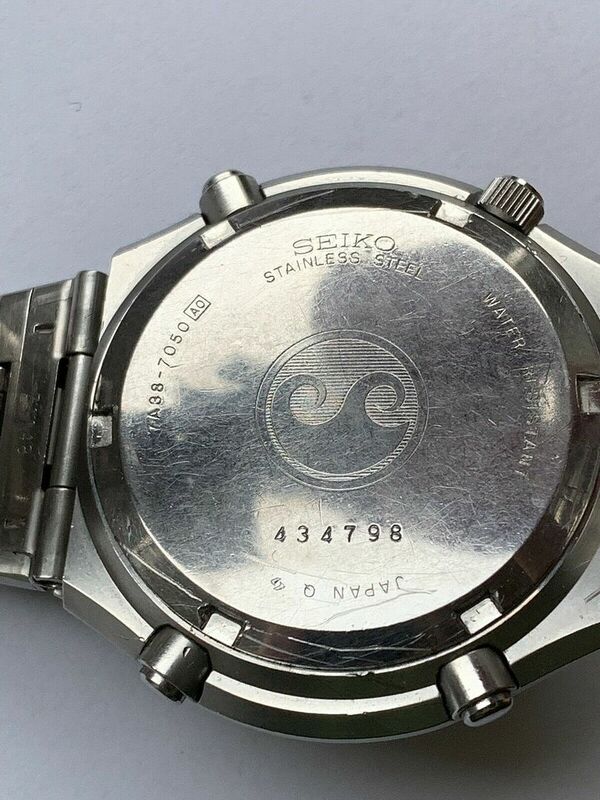 The seller has skimmed and polished the case-back, in his efforts to remove the slipped tool-marks from the rim, but the number remains the same. He's fitted a replacement crystal - and as I wrote in the first paragraph, evidently attempted to touch up the bracelet's small interconnecting links with a permanent marker. Also, if you check the bidding history of the previous auction, you'll see it was won by bidder t***i (1858) which ties in with the current re-seller's ID - ein2tien (1858). You don't need to be Einstein to figure that out. 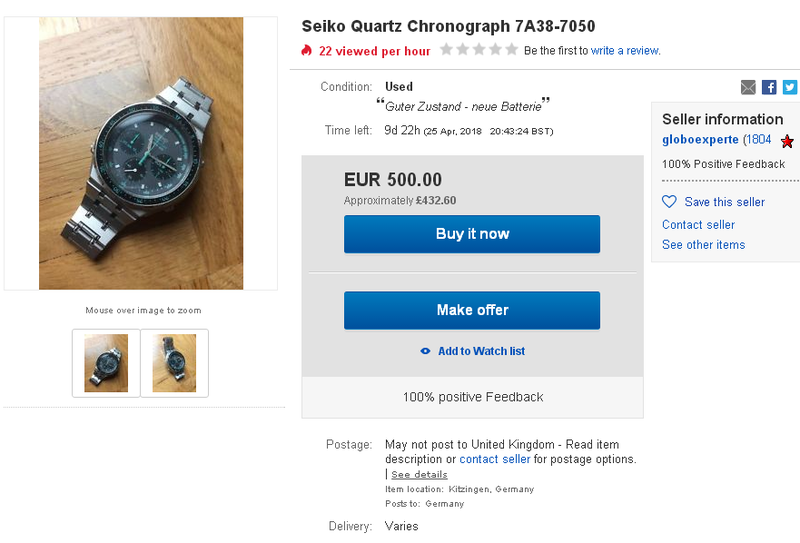 The 5-day German eBay auction for the above 7A38-7050 ended earlier this evening, selling (or should I say re-selling) for a strong 580 Euros after 3 bids. 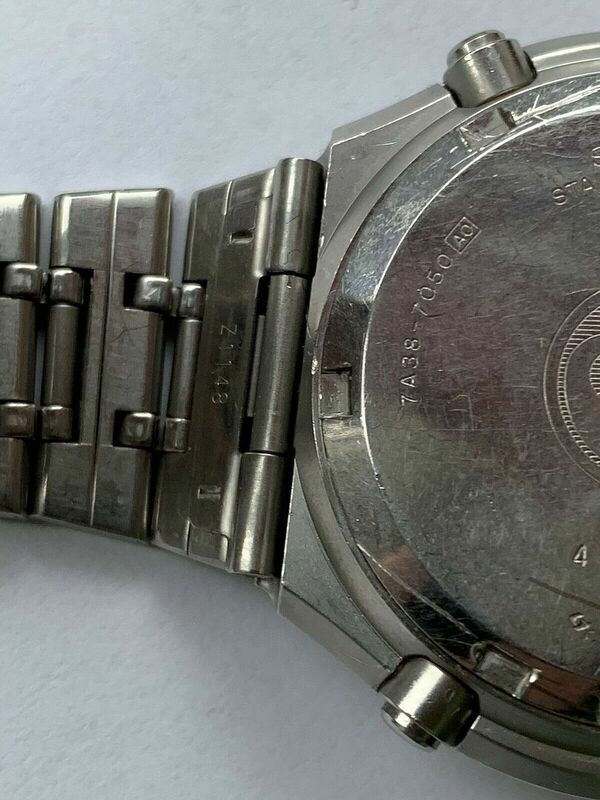 This 7A38-7050 in average worn condition, was listed in the early hours of this morning by an Italian eBay seller, as a 5-day auction, with an opening bid price of 150 Euros. He's selling it as 'for parts or repair' because of a couple of inoperable pusher buttons. Not an unusual occurrence with this model, due the length of travel. Their operation can be ponderous at the best of times, regardless of how good the condition of the switch levers may be. 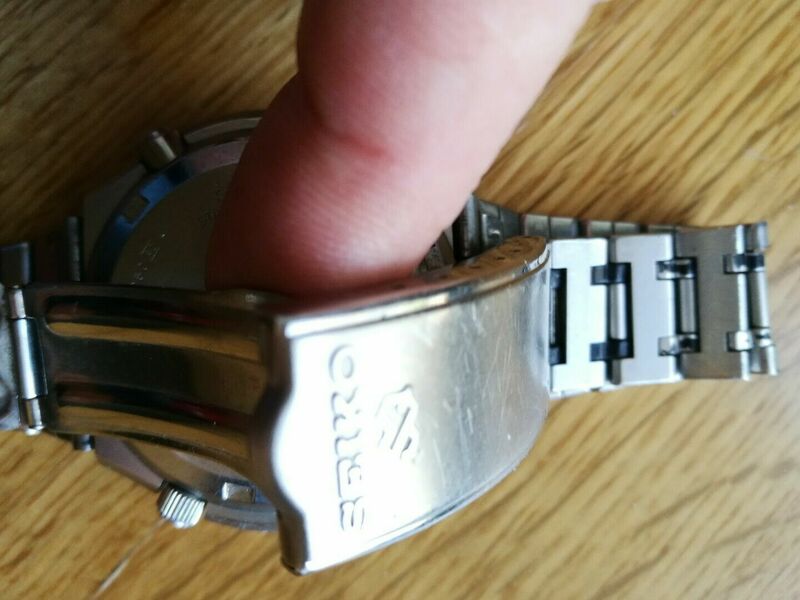 Note the misaligned Tachymeter ring, pointing to someone having removed the movement at some time. I had to smile at the title. Perhaps the seller is colour blind - getting Pepsi confused with Peppermint. Originale funziona e tiene il tempo anche il cronografo funziona ma viene venduto per parti o riparazione perche due tasti nn funzionano,si esclude ogni garanzia e restituzione. The above 5-day Italian eBay auction for a 7A38-7050 in need of some TLC, ended in the early hours of this morning, selling for the opening bid price of 150 Euros.